This piece marks poem 400! This was not begun as a poetry blog. But my readers enjoyed and supported my first attempts – and a poet has been born! THANK YOU! This entry was posted in Autumn, Fear, Nature, Poetry and tagged chill, emotions, frigid, frost, ice, nature, personality, photography, playing the game, poem, relationships. Thanks Ben! 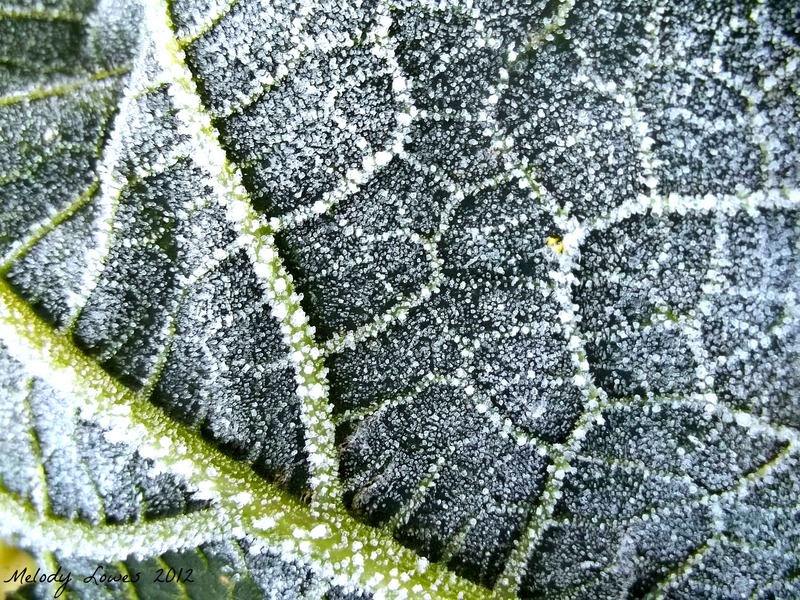 I got out early to catch this one before the frost melted in the sun – love the veins! Melody, you do an incredible job of mixing quality of word and verse in with the quantity you produce. Thank you for the wonderful pictures and poems. Congratulations on reaching 400 poems! Well done. So wonderful! Enjoy the gift! Congratulations! This is a lovely poem too. Congratulations on your 400th! You are a natural-born poet, Melody. It’s true. Things grow and bloom, you make poems. Right conditions – this blog? Thank you so much, Maria – I really appreciate that high praise form a fellow writer! The whole blogging world has been a great venue, that’s for sure – for many besides myself, as well. How is your writing coming along? My progress is slow…please pray! Melody, I could sit at your feet and learn from you. I’ve been a poet for a long time…but feel I need to learn some new stuff. Ever thought about teaching about poetry on your blog? I am finally catching up on times past when my schedule was so busy I had no time to stop in. This morning has been so refreshing to linger and stay awhile at your posts! Thanks friend so sharing! In response to your comment about the broken system of foster care…Yes, but you and I know a God who can work around the system and bring healing to those broken places in people’s lives…Prayer changes things…will you pray with me for Gracie?